Thyroid problems in dogs are usually referred to as the conditions hypothyroidism and hyperthyroidism. In hypothyroidism, too little hormone is being released by the thyroid. The reverse is true with hyperthyroidism, where too much hormone is being released into your dog's body. The hormones made in the thyroid are labeled T3, and T4, which are of concern when diagnosing thyroid problems in dogs. Too little T3 and T4 result in a low metabolism and too much results in the metabolism being too high. The metabolic rate regulates many functions in the body including weight, digestion, the heart rate, the ability to reproduce, and skin and coat health. Hypothyroidism is much more common than hyperthyroidism in dogs. Treatment involves synthetic hormone replacement therapy and the possible use of homeopathic supplements designed to support and soothe the thyroid. Primary hypothyroidism is the most common thyroid disorder in dogs. Primary means that the disorder originated in the thyroid vs. being the result of some other problem in the body. Hypothyroidism is triggered when the thyroid gland begins to waste away (called atrophy) or from a condition called lyphocytic inflammation, which is a condition where cells called lymphocytes enter the thyroid gland, and then turn normal tissue into fibrous tissue (fibrous tissue is common connective tissue in your dog's body). This condition is known as an autoimmune mediated thyroid disease. It occurs when your dog's body produces antibodies, which normally fight infection, but instead attack the thyroid. It is not known why these two problems happen, although there is a higher incidence in certain breeds leading to the belief that it is an inherited condition. There are several symptoms to look for if you suspect your dog is suffering from canine hypothyroidism. Symptoms usually start between the ages of 4 and 6. Less common symptoms include eye, heart and reproductive issues (infertility). Diagnosis is done by looking at various hormone levels. If the level of T4 is low then your veterinarian will use other more precise tests are called a TSH and TRH stimulation tests. Treatment is with a hormone replacement medication such as Sodium levothyrosine. Dogs should respond in 1 to 2 weeks. The skin should begin to clear in 4 to 8 weeks. Your veterinarian will periodically recheck T4 levels to see if they are in a normal range. Thyro-Pet is made with ingredients such as Fucus vesiculosisis (sea vegetable used for thousands of years to support the thyroid), Astragalus membranaceous (helps with thyroid and adrenal gland function, helps to keep blood pressure and sugar in a normal range), Eleutherococcus senticosis (helps with energy levels), Urtica urens (circulation, thyroid and adrenal gland support). Thyroid Soothe -helps temporarily address some of the symptoms associated with a thyroid problem. It has ingredients selected to help with appetite problems, hyperactive behavior, shedding, hair growth problems and nervous behavior. It contains ingredients such as Chamomilla (soothing, relaxation), Lycopus (endocrine system, pulse rate, respiratory problems), Zingiber (calming), Cratageous (heart and circulatory system), and Nux vom (nausea, well being). Follow any of the links above to read the clinical support and for additional research. Consult with your veterinarian so that he or she can track your dog's progress. Thyroid cancer in dogs (thyroid carcinoma) is the most common cause of hyperthyroidism in dogs. The cancer is in the form of a tumor (also called a neoplasm which means abnormal cell growth). Hyperthyroid problems only occur in 10% of dogs that have canine thyroid cancer. 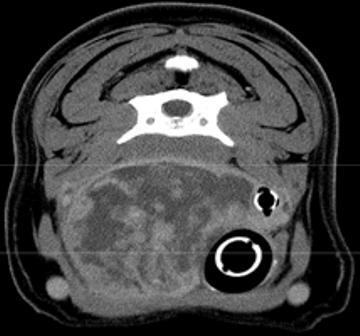 Thyroid tumors in dogs are usually fast growing and large. The only breed that has an above average incidence for this problem is the Labrador Retriever. Hyperthyroidism is not common in dogs. Treatment of canine hyperthyroidism includes surgery followed by chemotherapy and radiation. Survival after treatment depends on the size and the rate of growth of the tumor. This is one of the thyroid problems in dogs that is a very serious disease with short survival times. Follow this link for more information on canine thyroid disease.